I was looking for a Sunday lunch in Dulwich and found The Rosendale. The website gave a good impression, being quite heavily focused on families. We actually arrived before 12. The venue outside looked very large, they had a drinking area close to the entrance as well as a large garden (with a children’s playing area, including a slide). They were busy setting up, but were kind enough to show us to our table at the back of the pub (and next to the doors out into the garden). There were lots of paintings on the wall, as well as fun wallpaper. The table was laid out with linen napkins. I just had to order a Greenwich Mean-Time Pale Ale. Claire asked for a white wine. We were also served free table water. 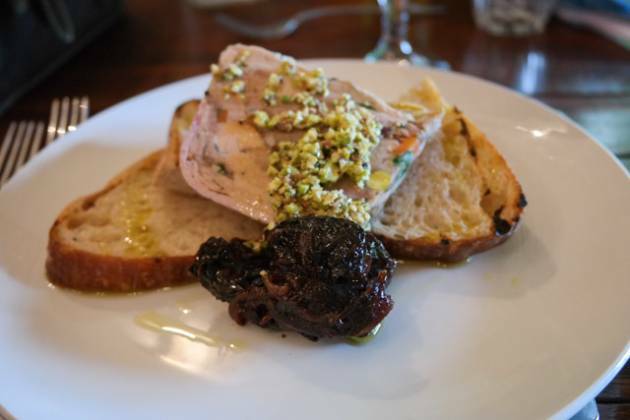 I ordered the pork and pistachio terrine, Claire asked for some olives. We also asked for JW’s roast chicken to come out at the same time (I’ll talk about this in the next section). My starter came out quick and looked very impressive. A thick slice of delicious terrine, with 4 pieces of sour dough slices. Very enjoyable and filling! 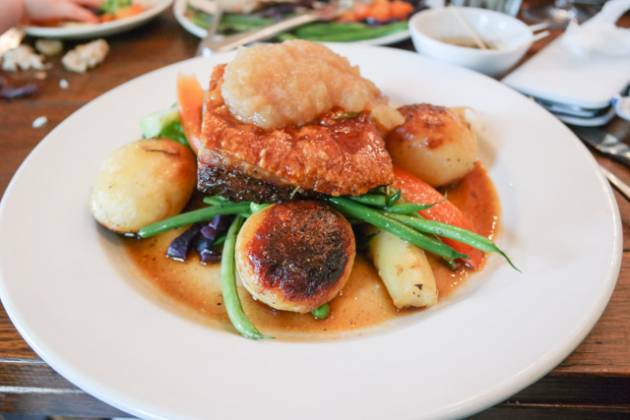 Claire ordered the roast pork belly. I asked for roast beef. JW had the aforementioned roast chicken. Lunch came out quickly after I finished my starter. The pork belly had a thick slice with lots of apple sauce (and cinnamon). Beautiful flavours and textures, it didn’t taste fatty at all. The roast beef consisted of 3 slices, cooked medium to well. Very nice indeed, although I would have preferred medium rare (it’s a family orientated Sunday lunch, so I assume they need to cater for younger tastes). 4 roast potatoes on each of our plates, along with parsnips, (a couple of !) peas, broccoli, red cabbage, carrots, green beans (with garlic butter) and a Yorkshire pudding. Tucking into the roast potatoes, they were very nice with an unusual spice flavouring (perhaps star anise? ); the vegetables were cooked perfectly. There was a huge amount of food! 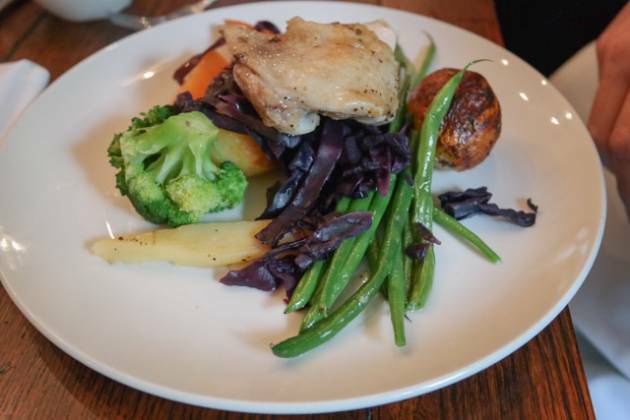 William thoroughly enjoyed his roast: a couple of potatoes, chicken breast, red cabbage, parsnip, carrots and parsnips. As he was off gluten, we asked for his meal without gravy. In the name of BestSundayRoast.co.uk, we had to try the desserts, even if we were stuffed. 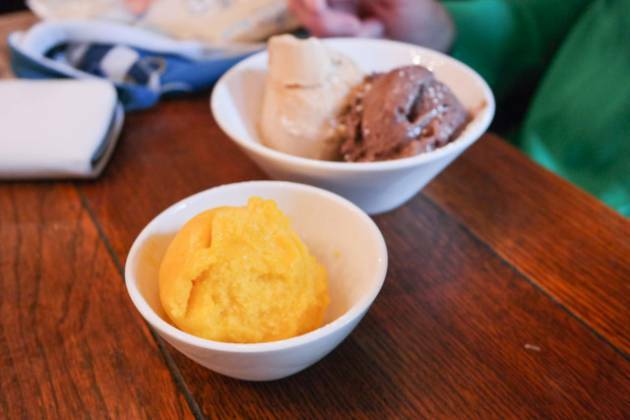 William was off dairy for a while, so Claire ordered two scoops of ice cream for her and one scoop of mango sorbet for JW. The salted caramel and chocolate ice creams were pretty special and very nice indeed. It was William’s first taste of sorbet and, whilst he didn’t have much, he definitely enjoyed it. 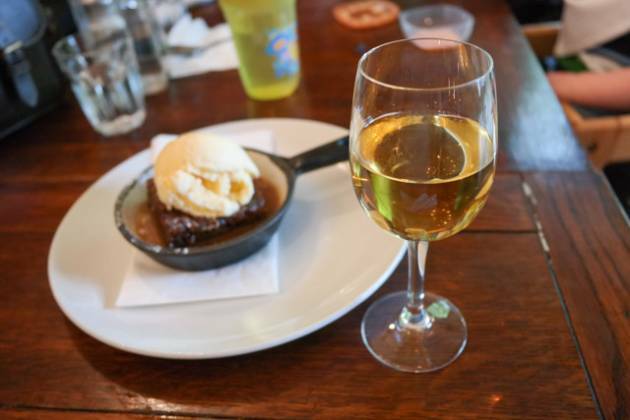 I ordered the sticky toffee pudding, with a dessert wine. I don’t normally have dessert wines, but it really brought out the flavour of the pudding – I’m a convert. An espresso and an americano to finish, along with belts being moved to one less notch! We didn’t have a need for the baby changing facilities, so couldn’t comment on this. They cater well for children though, with specific lunches and roasts for them. A large (for London) play area in the garden was a welcome surprise – it meant when we were waiting for lunch, William could play outside. The pub was full of well behaved children and families as well as friends could make themselves at home! 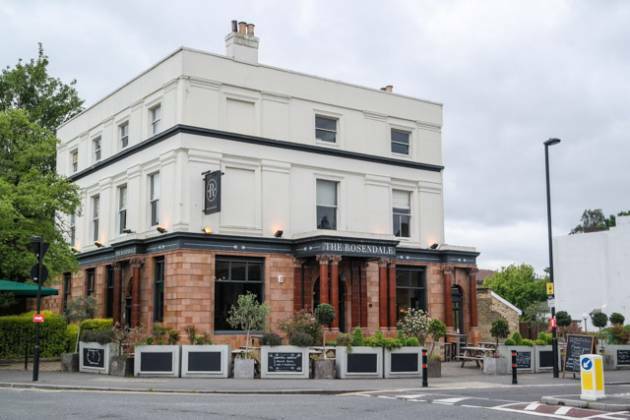 I absolutely loved our time at The Rosendale in West Dulwich. The staff were attentive and friendly, the food was excellent and children were well accommodated. Superb! 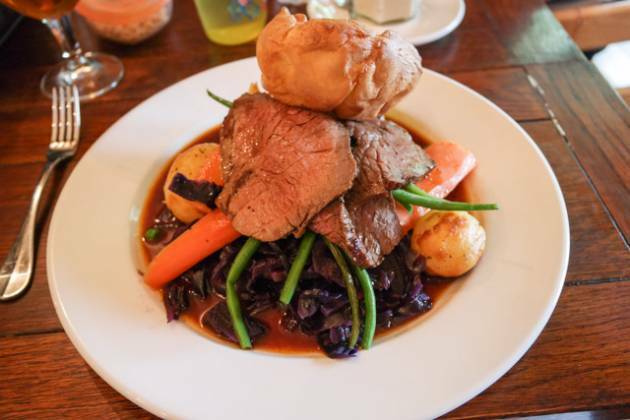 A well deserved Top rated award for Sunday lunch at The Rosendale in West Dulwich – especially suitable for families!